The concept of Digital Twin (DT) is creating and maintaining a digital representation of the real world of the factory and supporting its management and reconfiguration by the means of optimization and simulation tools, which are fed with real and updated factory data. 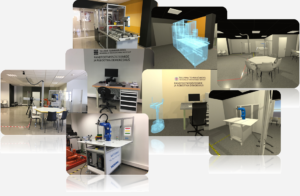 The aim of this research project is investigating the potential of an approach to connect VR applications with the DT in the specific domain of industrial robotics and collaborative robots. All these enabling technologies are particularly relevant in the modern factories, as their inclusion in the scope of Industry 4.0 can demonstrate.